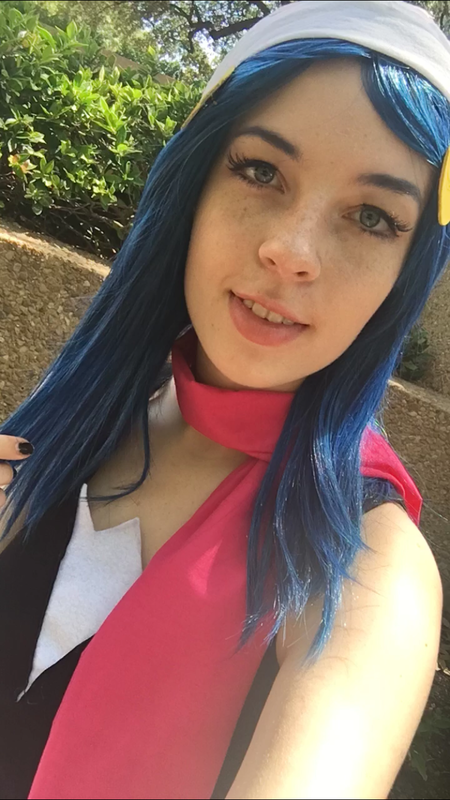 I was Dawn from the Pokemon Diamond and Pearl games/anime at Akon 2018! The wig was perfect for her although was partly hidden under a hat. The color and length fit her design so well. It was a simple yet cute cosplay that i put together last minute which is why i was so grateful the wig shipped so fast. Longtime fans of the Pokémon anime and video games are sure to recognize this character. Dawn served as the female playable character in Diamond, Pearl, and Platinum. She also makes an appearance in the Diamond & Pearl anime series as a contest-focused Pokémon Coordinator. Featured cosplayer Allison used the Theia wig from EpicCosplay as the base for this Dawn cosplay style. Theia is a super versatile medium-length wig that looks great straight from the package yet remains easy to customize for even the most complicated looks. Theia measures at 20 inches at its longest, with bangs pre-trimmed to 7 inches. A half-circle skintop at the crown makes it possible to part this wig in a variety of directions. Of course, this Dawn cosplay includes a hat – an easy solution to any part choice. The color showcased here is the rich Dark Blue Mix option. Are you considering a different color palette for your own Dawn cosplay? Theia is available in a range of other blues as well – from light colors like Ice Blue to the darker Blue Black Fusion and the unmissable vibrant Dark Blue. Not sure which color is right for your cosplay? Pick up an inexpensive wig color sample to find the perfect match.